I absolutely love Tommee Tippee Closer to Nature products. I’ve done a few other giveaways for them in the past and I am excited to show you their new line of products, Chewthers. I was sent a set of Chewthers to review and one lucky reader will also get a set for themselves. First, I do want to point out that all Tommee Tippee Closer to Nature products are BPA free. Chewthers are designed by a pediatric dentest to support jaw, lip, and muscle development. They also help with teething pain. Now for what I thought of them! Stage one is for babies aged 3 months and older. This chewther looks like a cross between a pacifier and a baby sized retainer. It is made to help prepare baby for thicker liquids. I did not give my babies solid foods (or thicker liquids) until they were 6 months so I would not need that until then. However, this is a neat teether! Since it is shaped like a pacifier it would be an easy transition for a baby who is used to that shape. The front is large enough that the baby can grab it and put it in and out of her mouth. When completely in her mouth it provides a teething surface that hits every area where teeth may be coming through (due to the mini retainer shape). It also provides a surface where a baby can chew on one side or the other (I know my son loved to pull his pacifier in and out of his mouth when he was teething). Stage two is for babies aged 4 months and older. This teether is fun! 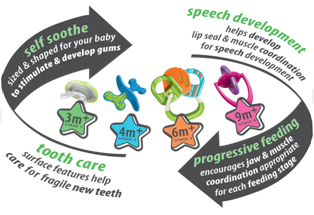 It is made to help prepare your baby to chew pureed foods, but just like the stage one teether, I would not need that until the sixth month. This is my favorite looking chewther. 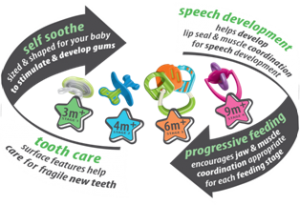 There are two sides with a pacifier-like center so a young baby can have a large surface to grab (and there is no risk of them putting the teether too far into their mouth). One side is slightly harder than the other side. Each side has two knubs that remind me of the Sophie Giraffe shapes. This would be a great teether, especially for a young baby. Stage three is for babies aged 6 months and older. It is designed to help prepare your baby to chew mushy foods. This teether reminds me of the toy keys that children chew on. There is a large ring with three shapes hooked to it. Each shape has a slightly different texture and all three of them are very large. It is three teethers in one. Stage four is for babies aged 9 months and older. It is designed to help prepare your baby to chew chunky foods. This one has a fun design. The entire teether spins on around handle and there are two soft rings that come out from a center piece. I think my son would have enjoyed playing with it and would have chewed on it, but I do think that he would have preferred the stage two or three teether on those nights where he was in pain. He tended to prefer designs like the stage two teether or ones with a large surface area like the stage three one. Please leave a separate comment for each entry. The winner will be chosen using random.org on Saturday July 2nd. I would like to win this so I can give it to my new goddaughter! She would look so cute with the pink one! My little girl is almost 2 months and my kids teeth early so I’d love to have these in pink for her. Shared “8 things you CAN live without” on FB. I like them on facebook and I said that you sent me!